I drew this––my first drawing of 2019––as a bit of an experiment to prepare myself before getting into the drawing of Chapter 4 (still untitled) to establish tone and to stretch my muscles a bit. In the middle of drawing Chapter 3 (“Making Smoke”), I started to gain a lot of confidence as I expanded my artistic toolset, bringing in more brushes (thanks to watching Josh Tobey ink those two pages from “Making Smoke”, which encouraged me to experiment more), and working with ink on the page. When I was working on my previous comic, I drew with clean, sharp lines. It was in an effort to create panels that looked like animation stills. With Long John, I wanted the comic to look like a comic––to be able to see the pull of the pen across the page. When I started, I wasn’t particularly comfortable with brushes, so I mainly used them to fill in large spaces with ink and didn’t consider nor try any of the stylistic possibilities brushes held. Where I talk about changing styles (at minute 3:08) between my previous comic, Eben07, and how I want Long John to look. Courtesy of Empire’s Comics Vault. As I developed more comfort with my artistic ability, the desire to see what brushes could bring to the comic also developed. While I haven’t done anything wild, seeing a brush’s unpredictable inconsistencies on the page have become happy accidents rather than elements that needed fixing––again, a holdover from working in my previous, animated style for six years. With regard to the image at the top of this post, there are points where the brush ran out of ink and the smaller strokes of individual bristles show through. Instead of going back to fix those by going over those clearly visible brush strokes with a loaded brush to make everything smooth, I left them as they were because they caused a striking tonal effect and was simply cool to look at. No one looks at those and sees them as mistakes except for me in my self-conscious gut reaction. 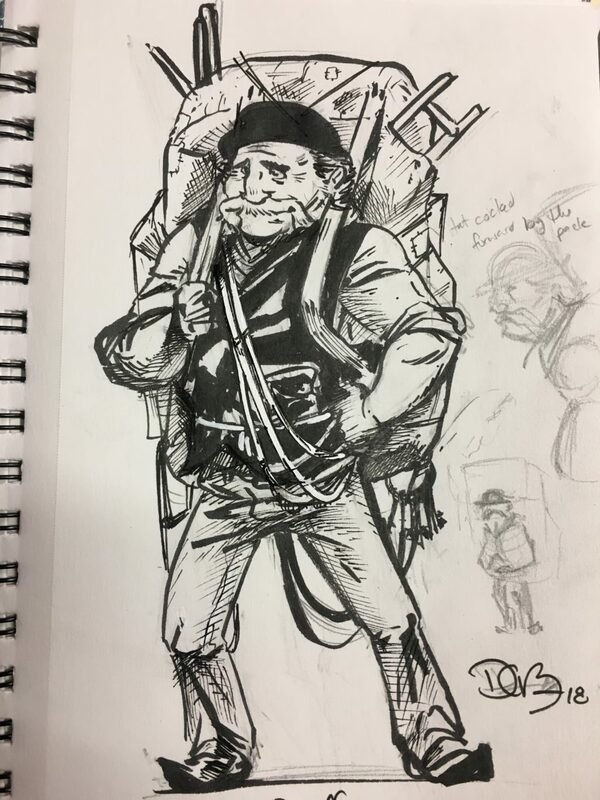 However, where Long John is going in Chapter 4 will find him unpredictable, further wrestling with who he was and who he needs––or wants––to be. So, with a new coat (spoiler for Chapter 4), I found myself inspired to try more expressionistic brushwork (though it’s not as wild as it could be) in this image meant to test out new ideas for the upcoming chapter. The result, actually––and I guess this is another spoiler––could likely become the cover for Chapter 4, so don’t be surprised if you see this image again down the road. In a twist on The Week, to celebrate the end of the year I’m going to be making individual posts about the things that really stuck with me this year. These are the things that I kept coming back to and kept thinking about and, if possible, kept diving into the hole it created in my wallet. This ultimate post, however, looks at the comic itself and how it fared this year. 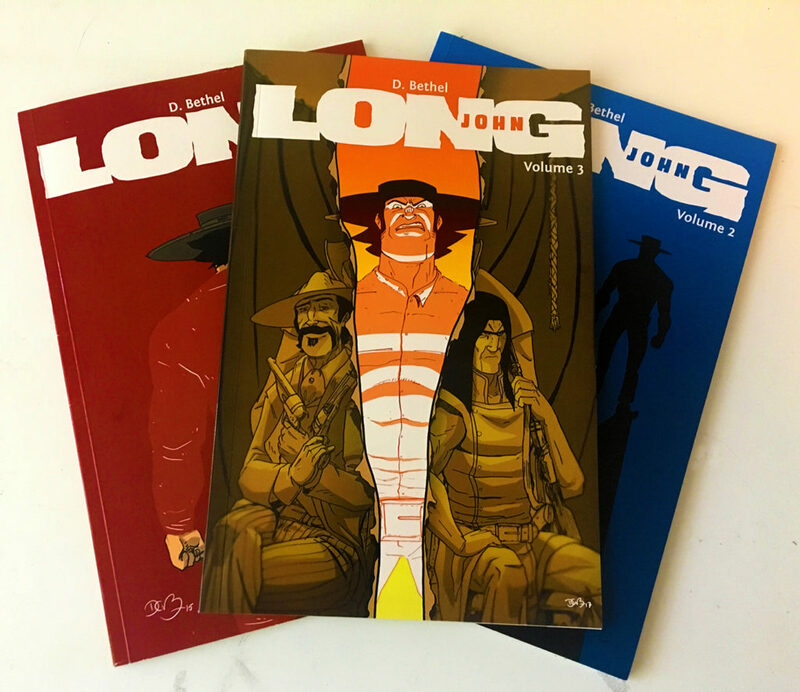 As with every year that a Long John book is released, 2018 felt like a big year for the comic. I felt like Chapter 3’s web release was strong all the way through––uninterrupted updates twice a week with full blog posts for seventeen weeks straight. That, combined with more shows––and more successful shows––I feel quite accomplished with Long John‘s presence and visibility in 2018. Below are some of the major accomplishments by my estimation. I’ve talked a lot already about the importance of Chapter 3 not only to Long John’s story but to me as a creator. As the conclusion of the comic’s first arc, I really worried that it would be incongruent with the chapters that came before in terms of continuity of narrative, voice, and even art. 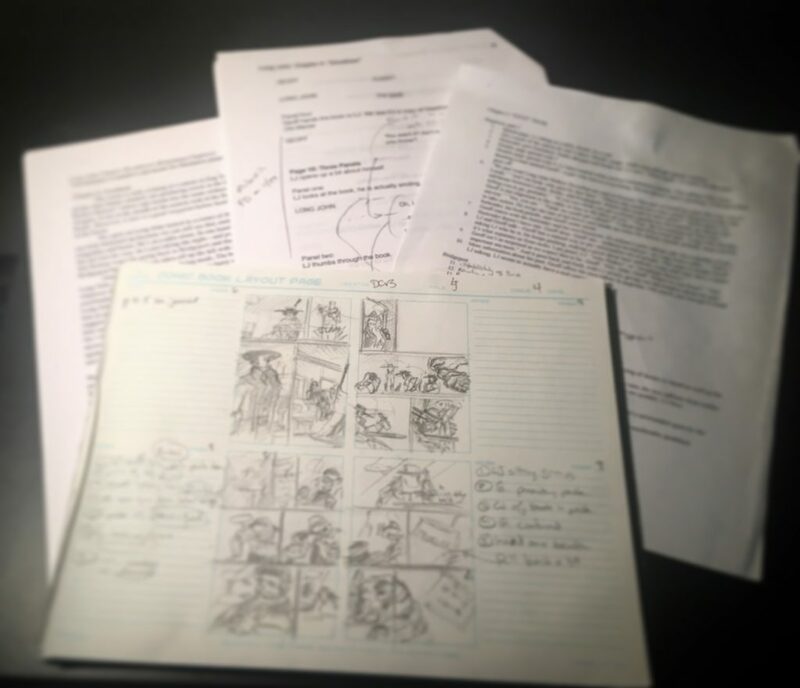 I wrote how finishing Chapter 1 was a personal victory because I was able to show myself that I could do this comicking thing on my own, that I can get to the end of a piece of a new story. Completing Chapter 3 was that but on an even larger scale. This has become a beast that walks and is officially headed toward a destination. And, for me at least––and according to a nice handful of people that confided their opinions to me––Chapter 3 works. It’s a piece that fits into the larger jigsaw puzzle that is storytelling. Knowing that fills me with such a confidence and fervor for making more that I can barely contain my enthusiasm to get back to the table. You could even buy the three-book bundle for only $20! 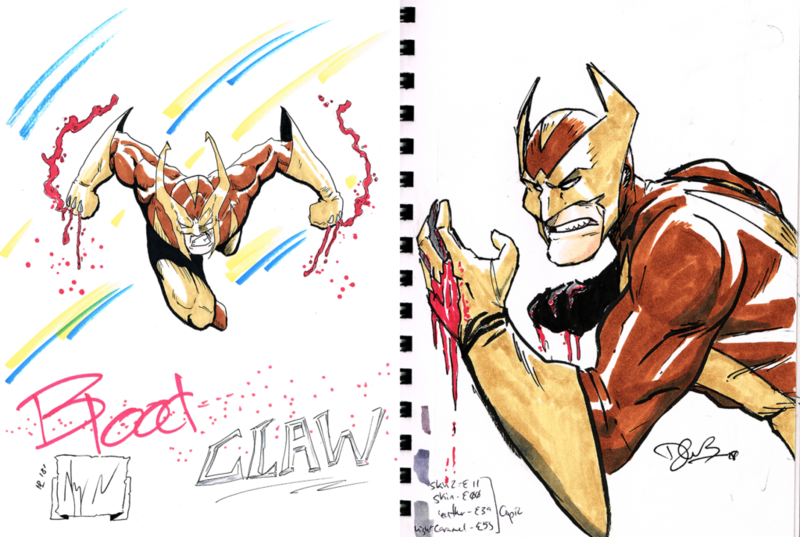 They come signed and with a custom Long John sketch! Chapter 3 itself was a series of firsts that accompanied a strong feeling of growth and confidence by its end. I got to collaborate artistically with my best friend of almost thirty years––Josh Tobey––on this chapter. I feel that Chapter 3 is my best drawn chapter so far; by its end, many things I actively disliked drawing––architecture (to an extent), natural environments––became, if not things I enjoyed drawing, things that didn’t bother me anymore. I got to flex some creative panel layouts with the fight scene, something I felt I hadn’t really done since the beginning of Chapter 1. After all of this, I’m incredibly proud of these three books and feel they represent the best expression of what kind of comicker this guy named D. Bethel is. Thank you all again for your support during these four years. It literally means the world to me. This year added two shows to my regular appearances at Free Comic Book Day and Crocker-Con. First was the Toy, Game, and Pop Culture Expo in Carmichael which was a fun experience and I got to see a lot of people I have met over the years. The next new show was one I was eager to go to, but registration always seemed to pass me by: StocktonCon. 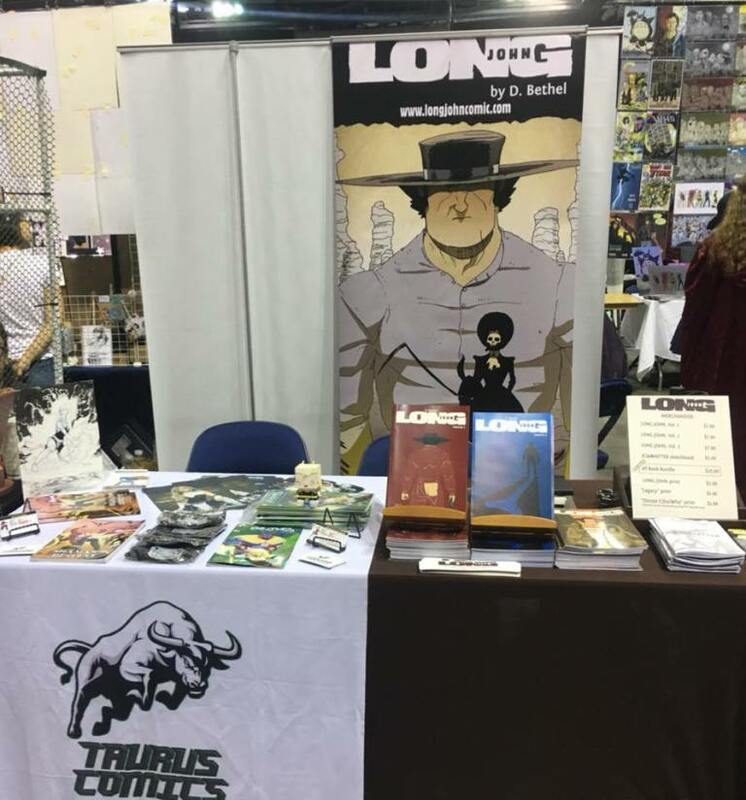 The shared table with Kyrun Silva of Taurus Comics at StocktonCon 2018. 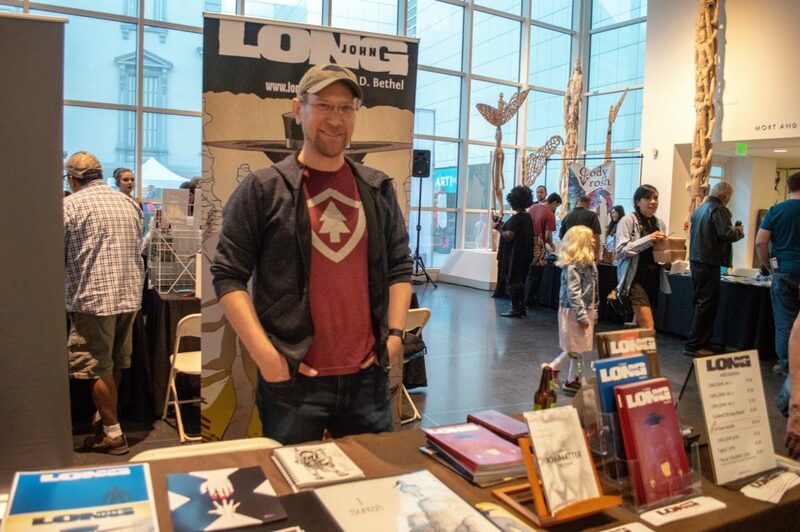 Luckily, a spot opened up where I was able to share a table with fellow local comicker, Kyrun Silva of Taurus Comics, and while it wasn’t my most profitable show ever, it was the most fun I’ve had at a show in a long, long time. Kyrun’s Blood Claw on the left, my version on the right. 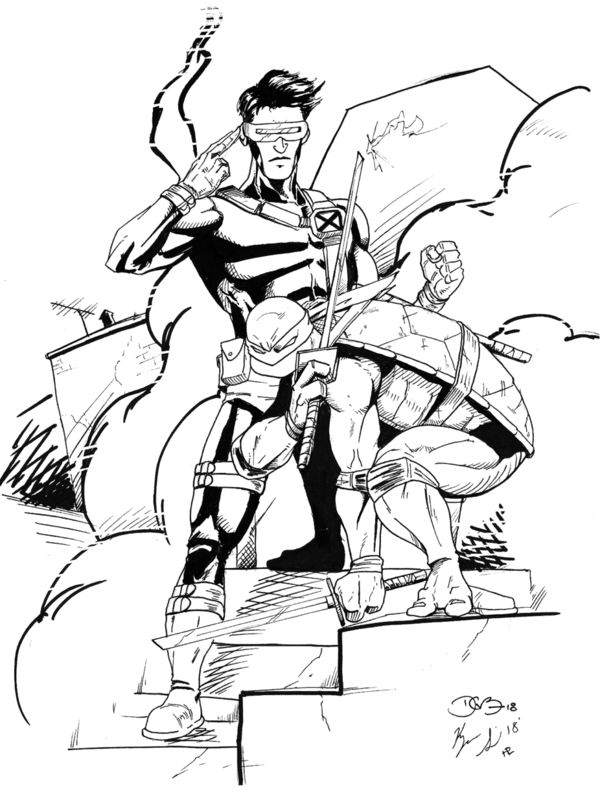 Most of the enjoyment came from getting to hang out with and talk shop with Kyrun (more about that below), but also getting to draw with him on the collaborative joke character, Bloodclaw, and getting him to ink a Cyclops/Leonardo drawing I made. Super fun. Drawn by Dan, inked by Kyrun Silva. However, my two tentpole shows––Free Comic Book Day and CrockerCon––were major successes. 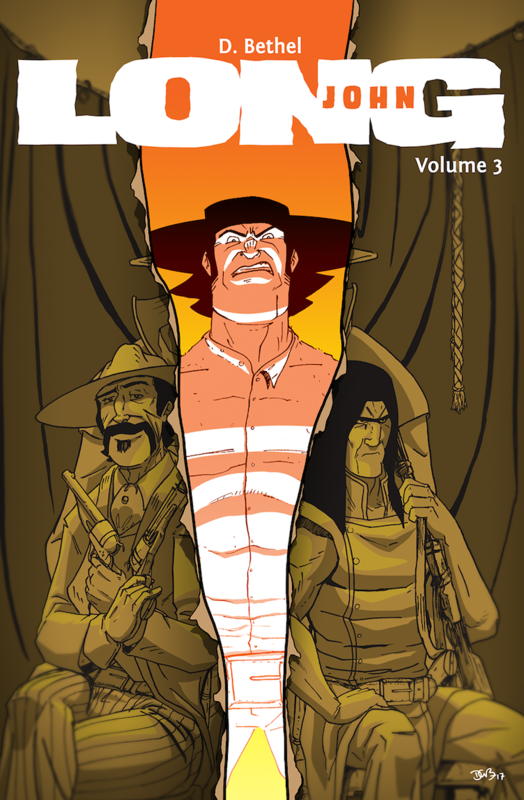 Armed with Chapter 3 and a nice bundle option, I got Long John––a complete arc!––into the hands of more people than any show before. CrockerCon, especially, was a windfall show for me. Everything just fell into place to become a sublime experience for me. I already love the show to death because of the variety of attendees, but with the confidence of having the third book and a few other shows under my belt, it was the cap on a series of shows that I hope to never forget. And I got to be on tv promoting Long John. I was sad that the Alternative Press Expo didn’t happen this year; I did well last year, but it was clear the show wasn’t in the healthiest of times. I’ll be doing new shows in 2019 and, if 2018 was any indication, it looks to be a fairly prosperous new year. In conjunction with my nerdy/geeky weekly podcast, A Podcast [ , ] For All Intents and Purposes, I released a limited series podcast called Con Artists. Recorded in the car and the drives to and from Stockton Con with Kyrun Silva, we shared our ideas and thoughts about reading, making, and selling comics. It started as a trial run for a new portable recorder I purchased, but while editing the audio and listening back to the conversations, I was pleased with the thoughtful discourse about being in this independent comics grind and how it’s a strange knot of fandom and creativity that, in a sense, holds us back and pushes us forward. I look forward to not only recording more Con Artists in the future, but I’ll definitely get back on the mic with Kyrun to, at the very least, record our growth as creatives as time moves forward. A look at the work so far into Chapter 4. Chapter 4 marks a fresh start for Long John. 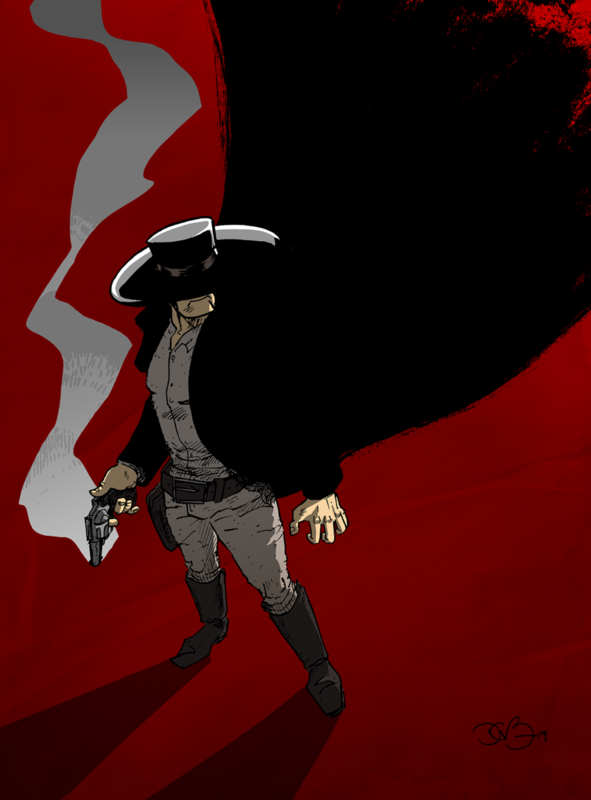 With the mystery established in Chapter 1 out of the way, and the storylines with the Johns ostensibly done, we see what happens next for our favorite grumpy, denuded, gunslinger. Layouts and scriptwriting are going very well. I’m ready to start drawing, but I want to get through laying out the last third of the chapter before I do. What to say about Chapter 4? We meet a new major character, The Rook, who was briefly mentioned in Chapter 3. Not a lot happens in the chapter, but it will be one of the more harrowing and brutal chapters in the story as we plumb the depths of Long John’s psyche, despite also seeing him at the happiest he’s been so far. We will learn more of his backstory, as well. You’ll also meet this dude. There’s a lot coming down the pipe and I’m eager to not only draw it but to share it. I’ll let you know as it happens, of course. 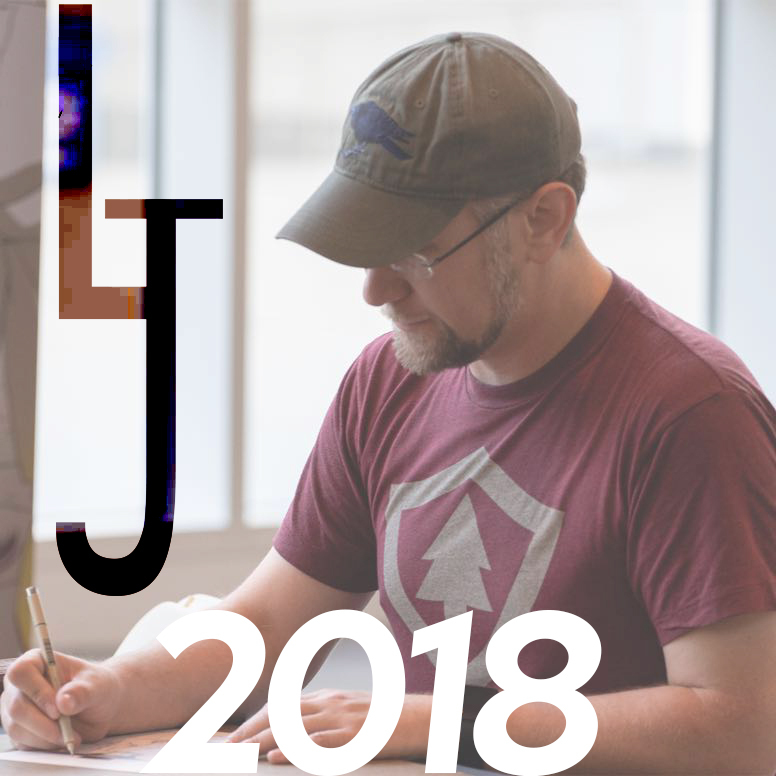 2018 was a huge, year––a success that sets up a lot of expectations and ideas for 2019. Thank you for being here for it and stick around for what comes next! In a twist on The Week, to celebrate the end of the year I’m going to be making individual posts about the things that really stuck with me this year. These are the things that I kept coming back to and kept thinking about and, if possible, kept diving into the hole it created in my wallet. I have no idea why I connected with this band’s music. Their sound evokes a time period that actually makes me bristle––there’s something about New Wave bands that drives me up a wall. Overproduced, synth-driven, yawning vocals puts me right to sleep. 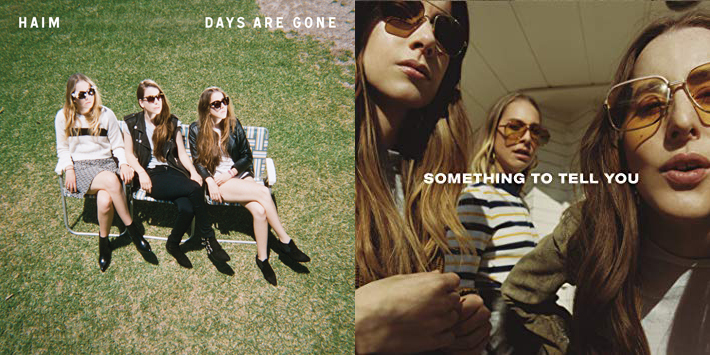 Even though the three sisters of Haim evoke the musicality of New Wave, their musical proficiency, earnestness, and creativity really come through clearly on every song, even if the lyrics aren’t particularly challenging (though profundity creeps in with surprising clarity every now and then). I found the band on a whim and a joke––but doing so took me to YouTube their live performances and, after watching a few, I was completely won over. I think this was the first performance I saw of theirs. When it comes down to it, this music is just instrumentalized (is that a word?) delight. The sisters’ talent with musical variety and creativity––often incorporating disparate ideas within a single song––underneath their haunting harmonies hit a chord in me that genuinely lightens my mood and gets me to feel better. As a barely competent musician myself, I often find myself listening to music and, after a bit of familiarity grows on me, I try to figure out how the music was done. While such an exercise is no doubt good for the brain, it often kills the music on the emotional level. It forces me to move from being the audience into the space of a performer and I don’t really have the ability to let the music affect me after such a transition. A lot of people are surprised by my adoration of heavy metal music. The truth is despite the aesthetics of the genre’s fans and musicians––black leather, spikes and studs, long hair, patches on vests of bands with violent or gory names or imagery––metal is actually populated by nerds. Of course, with a majority of fans being suburban teens, the fans of metal are also likely playing Dungeons & Dragons on the weekends, and playing high fantasy video games like Destiny or The Witcher as it allows them to be warrior badasses single-handedly saving the world. They’re likely Game of Thrones fans who read the books first and read comic books on a weekly basis. And this isn’t limited to the fans. It was Led Zeppelin that had lyrics about Gollum and Mordor from The Lord of the Rings in their song, “Ramble On.” Black Sabbath wrote music about giants and robots and wizards. Ronnie James Dio, of course, openly wrote about fairies and dragons and rainbows. Judas Priest wrote epics about fallen angels and post-apocalyptic wastelands (special aside: their new album––the 18th studio album––Firepower, released this year and is one of their strongest albums ever; it’s up in my top 5 Judas Priest albums, easily). Metallica wrote songs based on the work of H. P. Lovecraft. But a lot of heavy metal’s forward-facing subjects––especially those exacerbated by press coverage during the ’80s and ’90s––focus on violence, death, occultism, and despair. While those are perfectly valid topics, it does bury the lede of heavy metal’s nerdy roots. 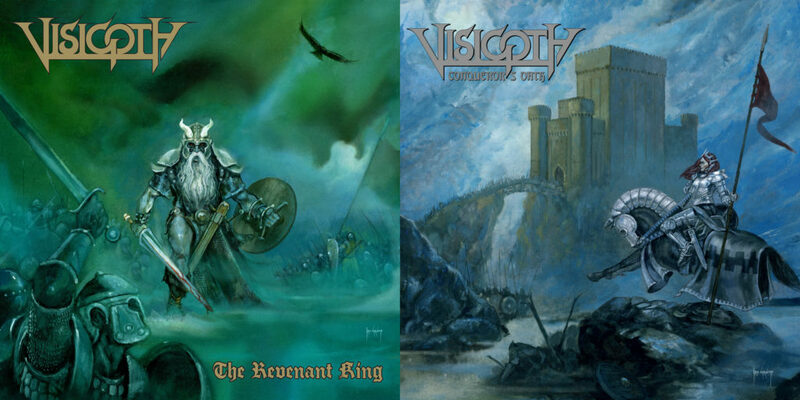 That’s why finding Visigoth this year felt like a huge intake of air after holding my breath for awhile. These guys are super nerdy and wear it on their collective sleeve (the bass player appears in all live performances and photoshoots wearing The Legend of Zelda shirts). Though their first album, The Revenant King,was released in 2015, I discovered it this year and then, after about five or six months with it, I bough their 2018 follow-up, Conqueror’s Oath. They lean into the fantasy/nerdy roots of heavy metal with zeal and devotion and I just ate it up because it was all couched by really strong writing and performance. Like Haim, in a way, they openly declare their inspirations but with an air of pride and earnestness that keeps it from becoming a joke. These musicians are very good at their job––the singer is especially powerful nigh operatic––and they are making music that means something to them, even if they’re singing a song called “Dungeon Master” which literally relates the imaginative and emotional experience of playing a good game of Dungeons & Dragons, or they’re playing the second album track “Outlive Them All”, which encapsulates the narrative thrust of the 1986 film, Highlander, verbatim. What I love about this band’s music is that the songs are excellently structured, comprised of––for lack of a better word––movements that not only push the music forward but also the narrative of their songs (and a lot of their songs are narratives rather than more traditional songwriting about singular emotions or moments). For example, my favorite song of theirs––”Mammoth Rider” off of The Revenant King––is about a Northman barbarian warrior riding down to combat an evil necromancer and his army because they wiped out the barbarian’s tribe, leaving him as the sole survivor. Midway through the song, a new riff is introduced that sounds like it comes from a different song entirely. It’s slow and trudging––evil-sounding, even. This makes sense because up until this point, the song was told from the point of view of the Rider himself. Suddenly, in this mid-song shift, the song is being told from the point of view of the evil necromancer before reverting back to the hero’s point of view. It’s so much fun and so self-indulgent and, as mentioned before, earnest (something that seems to be behind all of the entertainment that resonates with me) that I can’t wait to see what other tales they will tell on their next release. 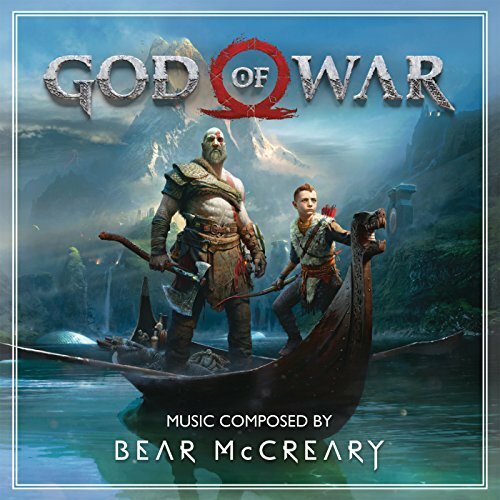 I’m a big soundtrack fan and, even though the score of this year’s God of War game is impressive and good, its strong cinematic timbre didn’t do much to make it stick with me throughout the year. However, as I wrote about before, because of my experience listening to the score a lot while grading––long before I ever played the game––I became extremely familiar with it in my own way, which may have hindered my playthrough of the game itself. The experience of playing a new game while also having it all feel incredibly familiar because I recognized the music made for a very surreal experience. It didn’t break the game for me at all––nor did it dampen my appreciation of the score––it just had never happened in that order before and I had, on accident, created a host of personal associations and definitions of these tracks outside of the scenes and moments they were actually composed for. It is kind of like listening to a radio program for years only to finally see the faces the voices belong to. That is often a jarring experience because when you don’t have that context going into it you create your own. I should go back to the score now that I’ve been done with the game for awhile––alternatively, maybe I should also go back to the game after not listening to the score in quite awhile.